Port Madison Now Has Two Rental V15’s! Thanks to the generosity of the Schmidts, Mitchells, and Walkers, the club has two Vanguard 15’s available to rent. If you want to race or cruise around Port Madison it’s as easy as getting checked out, reserving a time, and sailing from the dinghy docks. Join the fun and excitement of Friday night races or get the kids out for a spin during the week. The V15 is fast, stable, and comfortable. With sails and blades stored at the club you can be on the water in under 10 minutes. Rental fees will support ongoing maintenance, replacement parts and dock fees. 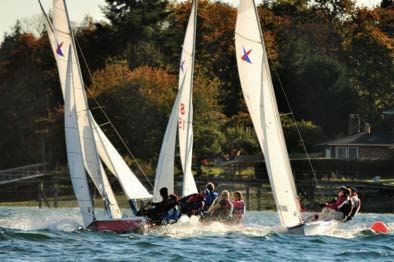 Submit a Checkout Request Form to schedule a time to review rigging and sailing club V15s. Submit a Rental Request Form to reserve a boat. Email dinghyrental@portmadisonyc.org with any questions.